Detailed plan sets course for advancing scientific discoveries and human health. 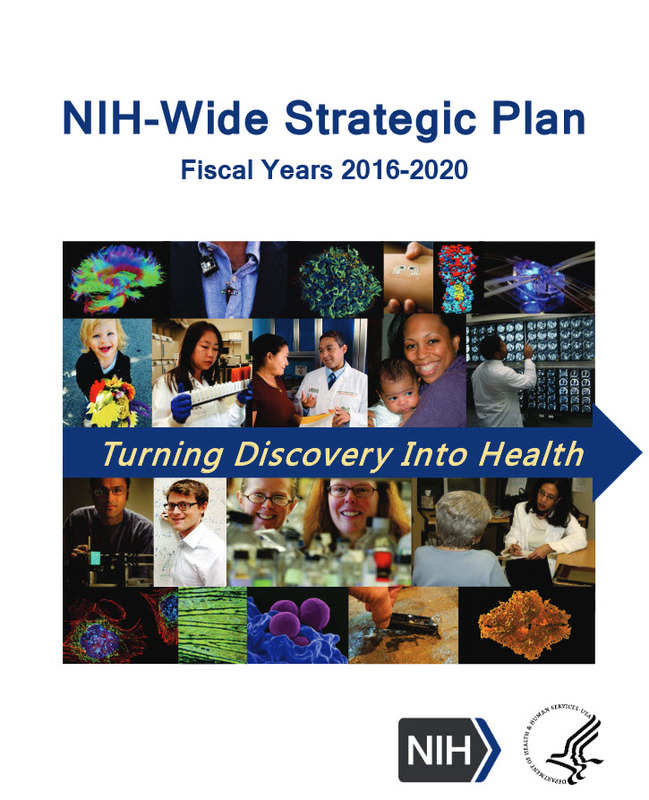 The National Institutes of Health (NIH) today released the NIH-Wide Strategic Plan, Fiscal Years 2016–2020: Turning Discovery Into Health, which will ensure the agency remains well positioned to capitalize on new opportunities for scientific exploration and address new challenges for human health. Developed after hearing from hundreds of stakeholders and scientific advisers, and in collaboration with leadership and staff of NIH’s Institutes, Centers, and Offices (ICOs), the plan is designed to complement the ICOs’ individual strategic plans that are aligned with their congressionally mandated missions. excel as a federal science agency by managing for results by developing the “science of science,” balancing outputs with outcomes, conducting workforce analyses, continually reviewing peer review, evaluating steps to enhance rigor and reproducibility, reducing administrative burden, and tracking effectiveness of risk management in decision making. “We are faced with extraordinary opportunities that demand exceptional attention if their promise is to be fully realized. Implementing these objectives will enable the more than 300,000 researchers supported by NIH across the nation and around the world to drive science further and deliver cures faster,” said NIH Principal Deputy Director Lawrence A. Tabak, D.D.S., Ph.D.
To inform development of the strategic plan, Dr. Tabak said NIH solicited input from a wide range of stakeholders through a Request for Information, which generated more than 450 responses; a series of interactive webinars, which attracted more than 750 participants; and meetings with 21 NIH advisory councils, including the Advisory Committee to the NIH Director. Many thousands of cancer patients will experience enhanced survival from application of precision medicine. A candidate vaccine that induces a broad antibody-binding response to multiple strains of the influenza virus will be in clinical trials — a critical step toward a universal flu vaccine. NIH-supported research will develop effective, tailored behavioral and social interventions to promote health and prevent illness in populations that experience health disparities. Application of pharmacogenomics in real-world clinical settings will lead to improved outcomes in the use of several drugs. A pivotal efficacy trial of a novel HIV vaccine, expected to begin in the Republic of South African in 2016, will confer at least 50% protection against the acquisition of HIV. NIH-supported clinical trials will show that at least a half-dozen interventions thought to be clinically beneficial actually have no value. Radical new methods for structural biology will revolutionize drug screening and optimization. NIH-supported research will directly contribute to FDA-approved therapies for at least a dozen rare diseases. Application of certain mobile health (mHealth) technologies will provide rigorous evidence for their use in enhancing health promotion and disease prevention. A wearable biosensor for monitoring blood-alcohol levels in real time will be developed and show efficacy for preventing alcohol-related injury and disease. Technologies to reverse paralysis and restore some normal functions will be available to spinal cord injury patients. Vaccines against respiratory syncytial virus will be field tested for efficacy, promising a solution for this leading cause of childhood pneumonias. Research on the artificial pancreas will lead to advanced trials showing significantly better management of diabetes, without dangers of hypoglycemia. NIH will be known as the model agency for applying the scientific method to itself — for learning and implementing in a rigorous way, how best to support biomedical research. Over the next five years, NIH leadership will evaluate the agency’s progress in meeting the objectives laid out in the strategic plan, which will be a living document that will be open to refinements throughout its life-cycle.